The Adams Occasional Tables are Mission-style tables with straight Mission edges composing the top, legs, and sides. These tables have vertical slatted sides, an open shelf in between, and drawers in the base. Arched table skirts and side corbels support the top and provide handcrafted character to this heirloom set. Charming simplicity defines these occasional tables. Handcraftsmanship in solid wood perfects them. The sturdy end, coffee and sofa tables feature geometric structure, wooden hardware, and convenient bottoms for extra shelving. When you have a living room that needs to be finished up with some complementary tables, these are a convenient fit. These beautiful tables with metal hardware and elegant slats perfect a living room. Each table has a drawer and a bottom shelf for function as well as beauty. These handcrafted tables in solid wood frame a sophisticated atmosphere. AJ#2 Occasional tables coordinate with the Cubic Slat recliner, loveseat and sofa. This set features 1" thick tops and arched bottoms. Please contact us if you would like to purchase a table individually. 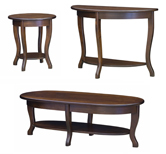 This sturdy set of tables is just what a living room needs for convenience and style. Each hand made table has a convenient drawer and bottom shelf. Solid hardwood, slatted style and metal hardware creates heirloom quality occasional tables. AJ #3 Occasional tables coordinate with the Heartland Slat recliner, loveseat and sofa. Please contact us if you would like to purchase a table individually as shipping may vary. These elegant tables are all about the slats. The convenient bottom shelf lends to the sturdiness of this table, while hardwood mortise and tenon joints give meaning to every detail. These amicable occasional tables have subtle Shaker curves. Look more closely and you see handsome panel sides. The classic details of each table are supported by mortise and tenon joints. Each inset drawer has dovetail corners, while pointed square hardware adds to the classic look. Clearly these were made by a tradesman. The versatile Shaker look can be made more modern with darker stain so your tables can match a quaint or modern heirloom living room. This occasional table set carries a modern simplicity. Straight lines and geometrics pair with metal hardware to complement a contemporary living room. The many drawers and compartments are an excellent choice for the organizer in the family. The taller end and sofa tables make use of their height to provide an extra row of dovetail drawers. While the compartment separators provide the visual appeal of vertical lines, they also support each already sturdy shelf. This is an heirloom set that looks fresh and new. Pictured in a custom two tone finish, frame in cherry with Acres stain and top with Natural stain.Custom finishes need to be ordered by phone. Pictured in oak with Medium Walnut stain. Pictured in brown maple with OCS-228 Rich Tobacco stain. The Elite Occasional Tables are Mission in style with squared edges on top, squared legs, and a squared open shelf. However, the slatted sides add extra style: in a set of vertical slats, the two edging slats are cut in mirrored diagonals to form an A-scheme. Arched skirts support the table tops to give these sturdy tables a welcoming look.